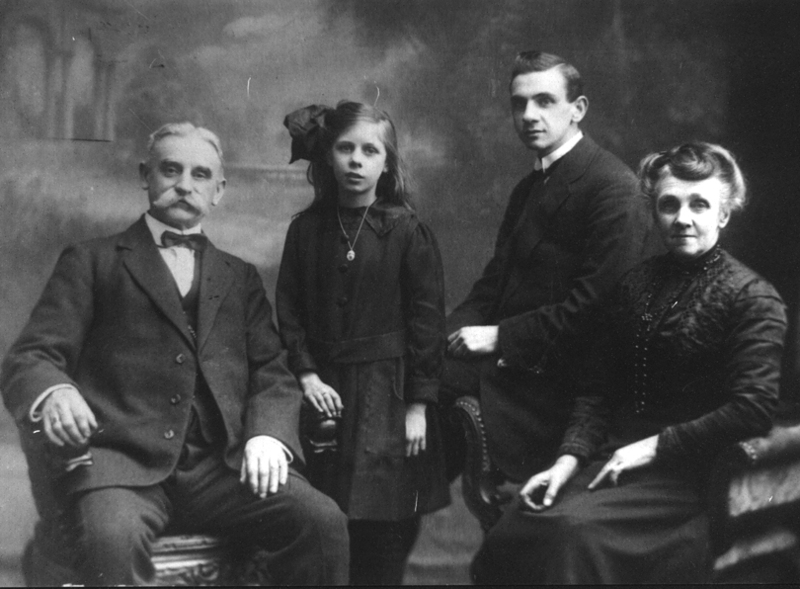 This is a picture of my grandmother, the small girl stood in the middle, her parents and brother. It must have been taken after 1918 because grandma is wearing the locket that had belonged to her next oldest sister Winnie who died in the influenza epidemic of 1918 aged just seventeen. My grandma was Doris Gibson, born 1907 in Wallsend, Northumberland, so she is about eleven or twelve in this photo. Her father was Thomas Harle Gibson, born 1864 in Longbenton, Northumberland and her mother was Mary Jane (maiden name Moderate) born 1865 in Carlisle, Cumberland. Robert Ernest Gibson, her brother, was born in 1897 in Hebburn, Durham and had served in the First World War losing a leg my mother says. Thomas and Mary Jane had eight children in total, that I know of, my grandmother being the youngest. Somewhere I have a piece of that good quality pinky purple writing paper that my grandma preferred with a list of all the birthdays for her immediate family ... 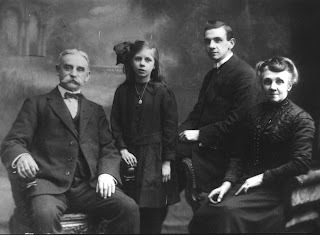 I don't know exactly when I found out that great-grandma Gibson's maiden name was Moderate, but it was something I knew before I started researching family history seriously. In fact this very name is probably the reason I did start. Since then I have found other families with the Moderate name in the late 18th and early 19th centuries in Donaghadee near Bangor in Northern Ireland (the extreme east coast of Ireland) and in Kirkmaiden, in the Rhinns of Galloway (the extreme west of Scotland), Ballantrae (again the western coast of Scotland) and another in Workington, Cumberland, just down the western coast of England from Maryport. The distribution of these families around the fairly tight area depicted on my map snip above still suggests a common root to me. After all, a friend from Northern Ireland once told me that Irish emigrants to Scotland used to row back to Ireland for church services, so they can't have considered a bit of sea a barrier to social activity. John Moderate married a local girl, Jane Ritson, in Crosscanonby, just north of Maryport, in 1804. They had four children, but only one, the first Jeremiah Moderate, born in 1810 in Maryport, survived to have a family of his own. With John dying well before even the 1841 census I have no way of determining his place of origin. When he marries Jane in 1804 one of the witnesses appears to be a William Moderate, so he wasn't alone in England at that point, however the only further hits for a William are two children in Workington in 1809 and 1811 to himself and his wife Grace. Then William, Grace and their family disappear from the English records. Do they die, return to their place of origin, be it Ireland or Scotland or emigrate? Another mystery. John gives his occupation consistently as Mariner at his marriage and the baptisms and burials of his children. However I am aware of no records for sailors that start as far back as the first couple of decades of the 19th century. Registers of Merchant Seamen don't commence until 1835. So that's another dead end. Various theories over the past twenty years have suggested that the name comes from the idea of Moderators in the Scottish church or that the family may have been immigrants from France whose name was mis-transcribed by an English clergyman or other official. I'm tending towards a seafaring family from Ireland who spread outwards from there. Before that, who knows? When I compiled a list of the Moderates in the English telephone book in 1996 I got no more than eighteen different addresses, plus a couple of strays in Aberdeen, Scotland and Bangor, County Down, Ireland. Writing to all the English hits I received sufficient replies to link each and every one of the eighteen to each other and all of them back to John Moderate in Maryport in 1804. I was very pleased to receive the replies to my letters all those years ago (seventeen years have since passed!) and I hope I managed to interest one or two of my distant relatives in their own family history. I was sent dates and names and in one memorable package an original indenture for a great-great uncle on his apprenticeship to the Co-op in Walker, Northumberland in 1880. Needless to say I copied that precious document to the best of my ability at the time and carefully returned it to its owner. Thank you so much for that. I even had a phone call in 1997 from a relative in Northumberland who already appreciated her Moderate legacy to the extent of preserving the name as her middle name after her marriage. I reunited my grandmother with her cousin Neville, whom she hadn't seen since he was a toddler - he and my mum kept in touch until his death only a few years ago. Thanks to one and all for all your help back then - I'm sorry I let the exchange of letters dwindle when I had to go back to full time work - if anyone even vaguely Moderate related would like to get in touch again I'm still here and I have time on my hands once more!